SnackTAYku International: Dim Sum in Trinidad, W.I. Trinidad being the multicultural melting pot that it is, it is no surprise that the cuisine represents all the influences of the different groups of people that came to inhabit the island. With West Indian spins and a blending of the cultures in the food, some unique dishes are often created. It is not all a mix in every dish and there are traditional dishes to be found. My aim was to find a dim sum house to see if any of that blending influence and Trinidadian twist could be found from what I may usually have in NYC. I suspected I wouldn’t find too much of a deviation and that’s mostly what occurred. However, as long as the dim sum was good on taste and texture (how do you determine that? This guide should help!) then I would be a happy fool. My uncle recommended a place called Eagles. What I did expect to find was perhaps slightly different seasoning on some of the dishes. He noted that the taste was better even if the variety and selection may not have been as broad as another dim sum house he also mentioned. Taste over variety always seems like the better option to me though I’m curious to know exactly how the other menu could have been expanded because Eagles had quite the number of options. Eagles was small enough to not be a place that provided the dim sum cart experience, instead ordering from a set menu was the system for getting your food. I always love seeing a cart being pushed by. I love the curious thrill of seeing all those stacked baskets or metal containers hiding treasures beneath their covers, only to be revealed quickly when a dim sum host asks you what you want or upon request. For us, the hot oil chili pepper sauce is always a must. This being Trinidad though, Trinidadian hot pepper sauce was also provided. Why? Most of us like our food extremely spicy (but not hot to just be hot - that just kills food, so the pepper sauce is usually tasty too. More on this on a future SnackTAYku). The stacks of metal steamers excite me! And what's that over there? A plate of crispy skin roast pork? Heck, yeah! In each of those stacked steamers, new treasures await. But first, the pork! Had this been a bit hotter in terms of steam heat not pepper hot, then I think it would have tasted better. The skin was a bit hard more so than crunchy on some pieces due to the fact that it was cold but as it stands though, the taste was pretty good. It had some great seasoning on it and it went straight through every bite. Despite the layer of fat on lots of the pieces I took, there were a lot of leaner pieces as well and those were just not as good on account of being a bit tough. Though see the crispy skin on that piece on the upper left? That would have had an amazing crunch. Hmm. I think I got to this dish too late and my friends and sister probably ate it up before I got a chance to get a piece like that. My fault though - you don't mess around with Trinis and food! You snooze, you lose! Pork and seafood shumai. What's there to not love? This one was great. I've rarely had a bad shumai but it can happen - mostly due to a lack of seasoning. That was not the case here. Not the tastiest I've had, nor the most appealing looking here as it's not that plump but what I wouldn't give to have one of these right now. Fried squid. A good golden fry, nice crunchy texture and not greasy - a good chew and good crispness. I don't know why I did not eat more of this. It tasted clean, and that's a very good thing. Turnip cakes. I had to try these here. I don't often get them on my other dim sum adventures because no one else really cares for them too much. There were enough of us willing to have them this day that I got to order a dish. I am so glad I did. For the first time, I've had a turnip cake where the turnip was shredded in leaving bits of stringy turnip for crunch and added texture. It was amazing. The taste on this was the best I've ever eaten and the bits of char sui pork infused made this even more delightful. Not quite the dish we wanted to order. I think we were looking for some fried dumplings of the crispy skin variety but instead ended up getting the fried rice flour skinned dumpling. I don't even remember what was inside, so no opinion. Did I even eat one? Swan, help me out! Excuse the messy plates going forward. This dumpling of rice flour had chicken and celery in it. Pretty good. A nice chewy bite that can throw you off if you're not accustomed but and definitely a texture issue for some. One of our favourite dishes that my sister and I must have are the pork spare ribs. These were so freaking good - fatty enough but not overly so, hot and the taste is one I cannot describe aptly other than to say it was well-seasoned. We like our Chinese black beans (a salty affair!) in this dish usually and they were definitely missed here. We don't order char sui bao at dim sum anymore. It's just one of those things that we've had enough of by our trips to Chinatown in NYC to know what to expect. So I actually stupidly declined this in Trinidad, forgetting where I was. In my momentary lapse of sanity, I almost missed out on a fantastic bao. The filling was a good mix of meat and fatty cuts, making it juicy and full on flavour. It was not too salty but oh so savoury. There was also no shortage of meat in this but no overly stuffed to upset the balance ratio. Coupled with the right amount of sweet of the dough, it was perfect. a sweet pepper stuffed with seafood/fish cake. And shaped like a heart! I was not expecting a compact fish cake on bite so I was a bit taken aback (silly me) but it tasted just fine. If I could end my meal with an egg custard, a custard bun and/or a fried bread nugget with condensed milk (oh man, not enough places have those golden nuggets of joy), then I shall do so. I always look for the steamed custard bun now (as opposed to the baked which is much sweeter). This one - look at that beauty. It was a nice, golden yellow with that rich, tempting colour. It was also really creamy and slightly warm and every bite was a joy. It was an amazing end to this dim sum experience. Having dim sum in Trinidad was a good time and I'm glad I managed to get it in. Good company, great food and lots of laughs as usual were all had. It was the perfect start to the late Sunday morning we shared together. 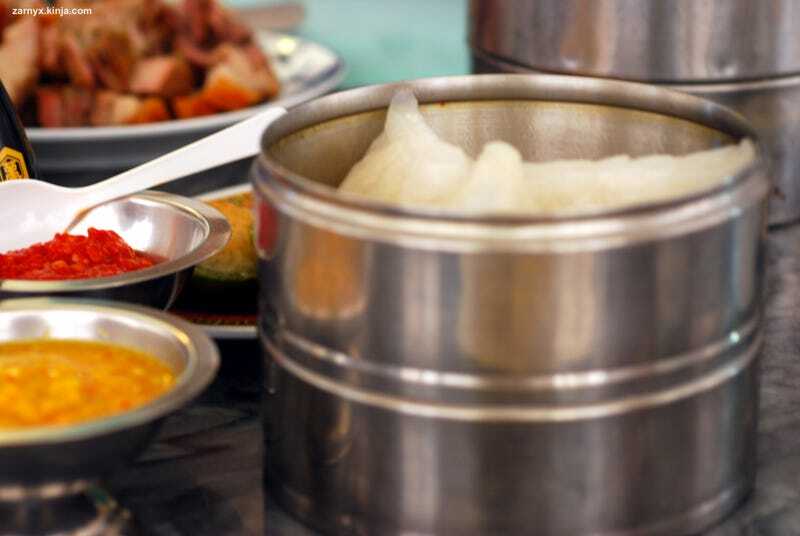 Truthfully, any day that starts with a good dim sum might always be a good start. In the future, I hope to share dim sum again with old friends and new! Except you, Nach... Swan, UI and I have decided we cannot take that chance with you due to your allergies. Sorry, friend. * Turns out I won the Dim Sum battle. I take this victory with a heavy heart though since SuperGeek had a bad time of it where he went. No worries, SG! When next you visit NYC, it'll be one of the first places we hit up on our Foodie Adventures. Visit TAY Classic. There's no dim sum there. Maybe there is? I don't know. But there'll be ramen there soon. Possibly. Do you want to know more about TAY and how things work? Check out the TAYtorial!